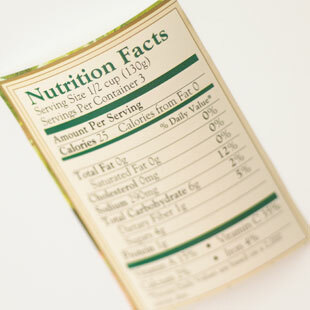 Demystifying the Nutrition Facts panel can help you eat more healthfully. Eye-catching claims on the front of food packages compete for your attention: Made with whole wheat! Reduced sugar! A good source of fiber! Truth is, the most helpful information on a food product is on the back (or side) of the pack, in the Nutrition Facts Panel, which is standardized by law. By having a basic understanding of what the terms in this panel mean—and how they affect you—you can make healthy, informed choices about what you’re putting into your body. 1. Serving size. To make comparing foods easier, similar foods must have similar serving sizes—but “one serving” might not be what you typically eat in one sitting. Always check the serving size and adjust accordingly. 2. Calories. Again, these only reflect calories in a single serving, and you’ll need to adjust if you eat more or less than that. 3. Total Fat. Reflects the total grams of fat per serving and the calories coming from fat. This information is less useful than the breakdown of the type of fat in the foods. 4. Saturated Fat. Look for as low as possible. Current dietary recommendations say that people should eat 7 percent or less calories from saturated fat. Per 2,000-calorie intake, that means a total of 16 grams per day. 5. Trans Fat. Look for “0.” But keep in mind that food with less than 0.5 grams of trans fat per serving can be labeled as “0.” Instead look on the ingredient list for any “partially hydrogenated” or “hydrogenated” ingredients, which are also sources of trans fats. 6. Cholesterol. As low as possible (aim for 300 mg or less daily). 7. Sodium. As low as possible (USDA Dietary Guidelines recommend 2,300 mg/day or less). 8. Dietary Fiber. As high as possible (aim for 25 grams for women or 38 grams for men daily). 9. Sugars. Interesting but not always useful, since labels don’t discriminate between naturally occurring sugars (such as in milk or fruit) and added sugars. 10. Vitamins and minerals. Vitamins A and C, calcium and iron are required to be listed on labels. They’re shown in the form of Percent Daily Values. Daily Values are reference amounts set by the Food and Drug Administration (FDA). You can use Daily Values to help you understand how a food may help you meet your needs for a specific nutrient. Percent Daily Values on Nutrition Facts panels are based on a 2,000-calories-per-day diet. Tip: Scanning the ingredients list can tell you a lot about a product. Ingredients are listed in order of how much the food contains, by weight. So if you’re noticing ingredients you’re trying to limit (think: salt, sugar or high-fructose corn syrup) high up in the list, you might think twice about opting for this product.